Add $3.00 for fries, slaw & a drink. 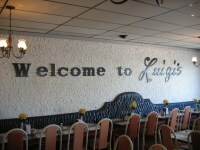 Luigi’s Restaurant is a well kept secret. You might drive right past it in if you weren’t looking for it even though it’s been there for 40 years. The menu spreads across two walls; there are two hot specials with Luigi himself ready to serve, or you can order off the menu from Maria. The specials include a selection of desserts. It's counter service, but it’s delivered to your table with a smile. The dining area has two halves. One is brightly lit with Formica tables and wobbly chairs, the other is an elegant dining room with comfy padded seats. The service was great and both Luigi and Maria came out to see us several times. I’ve classified the flagship Luigi Burger as a “Fat Boy” in order to compare its score to others, but really it’s in a league of its own. The Luigi is a force to be contended with and the presentation had a "shock & awe" factor. It’s a double 1/4 lb burger with bacon, mozzarella & cheddar cheese, onion rings & red onions and as well as lettuce, tomato, pickles and all the usual toppings. It easily stands 6” tall. The toothpick isn’t decorative, it’s structural. 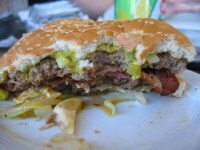 I had my usual bacon double cheeseburger. It was notably inexpensive at $4.80. Usually I get it with no onions, but one look at Maria and I forgot all about my special order. 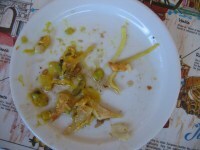 Was I ever glad I did because it came with fried onions (my favourite). The beef patties were thick and juicy - they appeared to be prefabed and didn’t have a lot of seasoning but were quite tasty. There were two thick, meaty slices of bacon, plenty of cheese and it came on a sesame seed bun (as opposed to the plain bun with the Luigi). 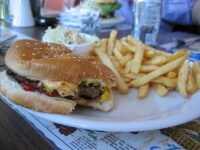 The bun was grilled - an extra fried treat. 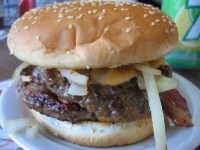 The burger was excellently sloppy! ﻿﻿﻿Some of the other lunch comments were: “There was lots of everything”, “ They were almost perfect fries” and “The first burp was yummy”. Usually we’re quite a boisterous group, but today it was a boys club and we were very quiet and well behaved. I took the opportunity of being unsupervised and added a front and back shot of a knitted burger girl to the BurgerClub blog. I think she adds some style to Burger Club. You guys have just echoed what I have been telling people for years. Luigi's is awesome! Especially if you go in the back door. You feel like you're getting away with something. Yes, I realize what I just typed. Where quality, quantity and value meet! Rae and Jerry's have a decent burger. Luda's Deli Burger is amazing. The A and V Drive-In is supposed to be great. I added Rae and Jerry's, Luda's Deli and A and V Drive-In to the list of contenders. Good recommendations! 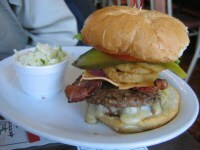 Help us find Winnipeg’s Best Burger!